We’ll return your vehicle back to manufacturer’s factory safety specifications. Or better. From frame straightening to paintless dent repairs, our certified technicians are trained to handle major impact damage, small dents, door marks and scratches on current makes and models. We use the highest quality parts and warranty approved equipment to ensure manufacturers’ (and Doug’s Place) standards are met. Our team will complete and submit your insurance paperwork: writing up the estimate, taking pictures and submitting the whole file to the insurance company for approval. Use our online estimating tool to begin the process. This typically involves damage that isn’t visible and can be costly to repair. If not repaired properly, your vehicle isn’t safe to operate. Doug’s Place technicians are experts at identifying, assessing and replacing damaged structural components. 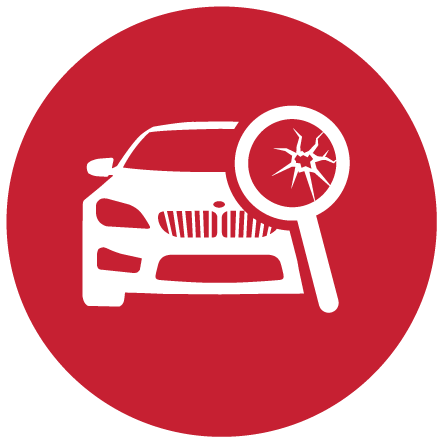 Our team will complete a thorough walk-around with you to identify the resulting damage. We’ll help document the repairs required and assist you in filing your claim. From conventional repair to paintless dent removal, we handle all types of hail repairs. Call us for an estimate and we’ll thoroughly examine your vehicle using the latest in light inspection technology. We can handle all of your vehicle glass replacement needs. We’ll help you see your way clear again.